This strikingly handsome two-toned Alfa Romeo 8C 2300 Castagna debuted at the 2008 Pebble Beach Concours d'Elegance, winning First in Class after successfully completing the Tour d'Elegance. The earliest history of chassis number 2311214 is not entirely clear. Despite having been built in 1933 its first known registration, Florence plate number FI 25691, does not appear until it was acquired by a Mr. Olivero Olivieri in 1939. By 1941 the car had arrived in the United States, with a New Jersey bill of sale listing a Lieutenant Frederick MacHugh as owner. 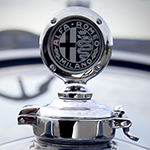 Mr. Haig Ksayian purchased it in 1942 from George Rand's garage in Manhattan for $1,500, still wearing its pre-war Italian license plate from Florence. In 2001 David Sydorick acquired this car from long-time owner Ksayian, together with a Zagato-bodied 8C 2300. When purchased by Bud and Thelma Lyon in June of 2005 from the Sydorick collection, it appeared that the car had not been on the road since the mid-1950s. The fact that there had been changes and modifications made to the body were immediately evident, as the body had been partially disassembled and repainted years before. The question was: When had those changes occurred and were they historically important? According to Gioacchino Acampora of Archivio Carrozzeria Castagna, the unusual styling features were a result of a succession of evolutionary styling updates made to the original coachwork by Castagna and shown by the coachbuilder in the Milan "Salone dell' Auto". Our extensive research, in conjunction with noted Alfa Romeo authority Simon Moore, led us to the conclusion that there were essentially two different Castagna styling treatments within the eight LWB Castagna-built 8C 2300s, giving the Lyons the confidence to restore this car back to its 1933 configuration.